Perhaps the most renown (and in my opinion, the most delicious) is the legendary Din Tai Fung. Din Tai Fung is a dumpling house with locations in Monterey Park, Seattle, China, Japan, Korea, Australia, Malaysia, Thailand, Singapore and Indonesia. 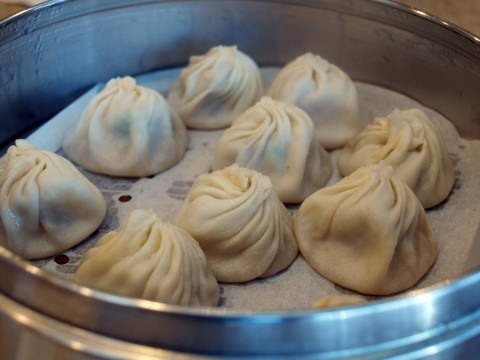 The famous dumplings are what some refer to as "soup dumplings", in which a thin, soft noodle pouch encases pork floating in a hot delicious broth. I have yet to sample better dumplings, and I have to wonder if these are perhaps the best in the world... considering the establishment has the Asian market well covered. Yelp reviews here; Wikipedia page here—a must have if you've yet to try them! Din Tai Fung does have the best dumplings...although one of my friends swears you can get better ones down the street. You buy them frozen by the bag and bring them home to cook. I'll have to ask her for the name of the store again. Dumplings and hot dogs are the two things I can eat forever. On their site, the Pork and glutinous rice shaomai with its open top looks delicious, I'll definitely try that.